The 32A Series temperature/process controllers set a new standard in 1/32 DIN power, flexibility and value. This group of controls offers the highest level of features in the most compact industry standard size. Ease of use is assured with the world’s first dual display 1/32 DIN temperature/process controllers. The Series 32A offers universal input (10 thermocouple types, 4 RTD types, voltage and current), single or dual set point, alarm (optional), Fuzzy Logic, Self-Tune, Peak/Valley indication, Percent Output indication and Heater Break Protection. Auto/Manual capability and 16 Segment Ramp and Soak with adjustable time base are also offered. Process protection features include open sensor protection, shorted sensor protection, input rate of change protection and loop break protection. 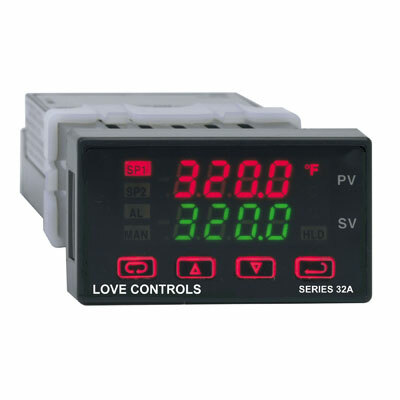 Selectable Inputs: Thermocouple, RTD, DC voltage or DC current selectable. Display: Two 4-digit, 7 segment, 0.259" high (6.35 mm) LEDs. Supply Voltage: 100 to 240 VAC, nominal, +10 - 15%, 50 to 400 Hz. single phase; 132 to 240 VDC, nominal, +10 - 20%. Memory Backup: Nonvolatile memory. No batteries required. Switched Voltage (Non-isolated): 5 VDC @ 20 mA. Proportional Current: 0 to 20 mADC scalable into 600 Ohms max. Agency Approvals: CE, UL E83725. Front Panel Rating: Type 4X (IP66).